Chris Cooley joined Mike Wise on 106.7 the Fan on Friday to talk about his release and his plans for the future. Wise of course starts the interview with his awkward NFL Films bit that makes my stomach turn. Then he goes into a bizarre Jacksonville Jaguars Super Bowl bit. Meanwhile, Cooley was on the line. 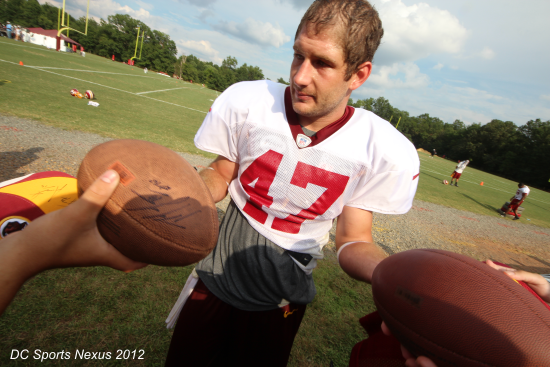 Cooley said he was back at Redskins Park on Thursday but just to clean out his locker. Chris said that the writing was on the wall for his release. He wasn't expecting it, but he wasn't surprised. He said he was fine with the preseason and the team playing some other players to see what they could do. He also says he doesn't like the "pity-party". "It's not my funeral. I'm not dying. I'm OK"
"I want the deal where the Packers were gonna give Brett Farve $2 Million a year for 10 years not to play for anyone else...I'll just hang out on the sidelines, I'll be the next Sonny Jurgenson around here"
"Without a doubt this area has become my home. I have no intention of leaving it. I have no intention of going anywhere. I don't wanna go anywhere else"
He said the only reason he would leave is for monetary reasons. Cooley was very humble and thankful for all the opportunities that the organization gave them. Good stuff. Listen below to the whole interview!